My cousin Roy Camp was one of the better watermelon-stealers in our part of the country, between Pawhuska and Buck Creek--or at least he told the best stories about when the farmers really DID use rock salt in the shotgun, and he once went around for days unable to sleep on his back or even sit down because he got peppered with some of it one afternoon. Sixty years later, when I was out in California visiting with him and his family, we got to talking about some of those good old bad old days, so after I was back in St. Louis, in June 1996, it was time to write Winning the Dust Bowl for Roy, who as is said in the poem had taught me to read back in 1936. He had lived with us that whole year, out in the Buck Creek Valley, because not long before his father had been beaten to death in the Pawhuska jail (Roy had tried to pull the policemen off as they dragged his father through the doors). When his mother remarried, Roy did not at first like the new stepfather; so the year my twin sister and I started to Buck Creek School he lived and went to school with us. Three years later--as Steinbeck was writing The Grapes of Wrath--Roy and a buddy hopped a freight train and rode out to California to join his mother and stepfather at a sawmill near Truckee, up by Lake Tahoe. A few years later he married a good strong woman, served in the Marines in World War Two, then saw to it that his mother Loretta had a good house right near where he and Celestine located in Porterville. When I visited them for Roy's seventieth birthday and went down to the local mall for a birthday dinner, we couldn't move twenty feet along a sidewalk or an aisle without people greeting him with a big grin and handshake or hug. So when I wrote this I wanted to remind Welfare Kings like certain governors and presidents that the food on their table is put there not only by "immigrants" but also by "natives"--people looked down on by those in power, even as they hand rich contributors largesse from the banks and businesses and porkbarrels made possible by the Okies, Indians, Chicanos, Koreans, Blacks, Hmongs, Vietnamese and probably even a few capitalistic Brits and Ayrabs and Noo Yawkers out there in LaLaLand. and me, the academic Osage Okie out for a visit. enough to make it credible. Carter Revard, Osage on his father's side, was born in the Osage Agency town of Pawhuska, Oklahoma and grew up on the Osage Reservation there. He attended a one-room school in the Buck Creek rural community, won a radio quiz scholarship to the University of Tulsa, and was given his Osage name in 1952, the year he went to Oxford University on a Rhodes Scholarship. After taking his B.A. there, he earned a Ph.D. at Yale and taught medieval literature, linguistics, and American Indian literature at Amherst College, Washington University St. Louis, and elsewhere. He retired in 1997 but continues to write and publish poems and scholarly essays. 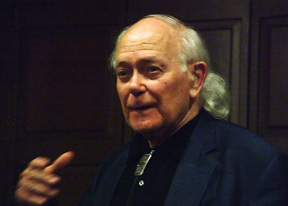 His books of poetry include Ponca War Dancers (1980), Cowboys and Indians, Christmas Shopping (1992), An Eagle Nation (1993), and How The Songs Come Down (2005). A collection of essays published in 1998, Family Matters, Tribal Affairs, was followed by Winning The Dust Bowl (memoirs and poems) in 2001. Some recent poems, including "Deer Mice Singing Up Parnassus," appear in AHANI Sing: Poems of the Indigenous Americas, edited by Allison Hedge Coke, from The University of Arizona Press.